The first thought I had went to those Duct Tape prom dresses ... could she fashion a "leather" corset or accessories from brown duct tape? It might need to be aged with some gel stain or something, but I think it could be awesome. Never underestimate the power and versatility of duct tape! I want to see what Sarafina comes up with, if she'll share! I would have a look in thrift stores for the two piece corset + skirt prom dresses that were really popular in the late 90s early 2000s. These would lend themselves really nicely to modification. A lot of the corset tops had detailing on the front panel that would be good. You could wear a vintage blouse under the corset & adjust the skirt to add ruffles, petticoats whatever. That would be my path of least resistance for creating a steampunk prom dress. Ooh, thanks for this post. While I don't really do steampunk (I just admire it from afar), I've been racking my brain for some ideas for a costume to wear to a Discworld convention in July and this has sparked some ideas. I see a corset in my future and I'll have to start prowling the local op shops. I don't know if she has access to a sewing machine or is comfortable using one, but Threadbanger.com did a series of videos on creating a steampunk outfit. If you type "steampunk" into their search bar it should bring up all of the relevant videos. They made a blouse, goggles, gloves, spats, a bustle, and probably a few other things that I can't think of. If you're looking to make REALLY tiny hatsthis tutorial shows how to make 'em from Styrofoam cups! It looks pretty cool; those pictures all have them in bright colors but you could obviously paint it darker too. Not sure exactly how to get it to stay..probably glue some hairpins on to the underside. I actually did this for my prom, before steampunk was cool! LOL! I used an old dress of my Mom's from the 1940s and cut the sleeves off. A couple more ideas - beautiful Cheongsam-style dresses can be bought cheaply online or at your local Asian market, and can be worn as-is, steampunked-up with boots, gloves and hair accessories. Also, you can buy ugly old bridesmaid dresses and alter them piece by piece. I'm not a great seamstress, but I bought an ugly, plain velvet A-line dress, cut the short sleeves off and replaced them with a long puffed sleeve using a printed translucent fabric, tulle for the "puff" and I re-used the short sleeves as long, button-up cuffs. Not a lot of sewing, but a great effect. BTW - I hope she will send pictures of the finished dress! Excellent information! I'm attempting to make it to me first con (but I live in the midwest - boo! No cons around here!) so this info will come in hand (hopefully) soon! Oh I love modding out dresses from the thrift store! If she can find one of those pleather tank tops those can be modded into all sorts of corset like waist cinchers. Related question: Is Sarafina's date dressing to match? Excellent post, very comprehensive. Hope the reader shares some pics. sounds like a lot of fun, hunting for stuff and putting an outfit together. These were such great ideas!! OH MY GOODNESS!!! 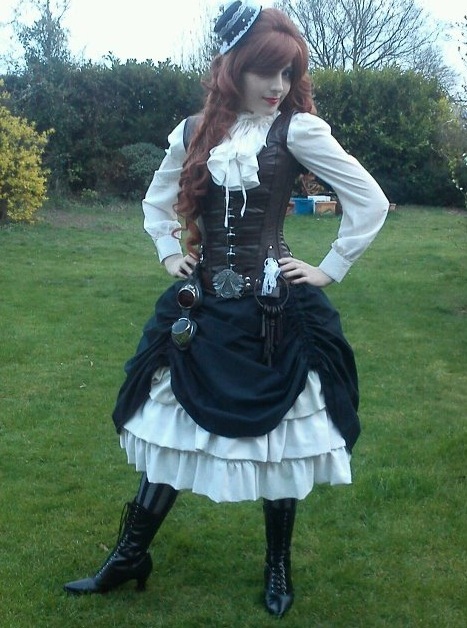 I am SO gflad this went up today because NO JOKE I was thinking (just a few hours ago) "I should send Jen some steampunk prom pictures (you know, if I actually WENT to prom) I mean, she has steampunk wedding and cosplay but not PROM!!" And HERE IT IS!!! Now I feel like a geek for being the second person to talk about this. And on a side note STEAMPUNK PROOOOM!?!?!??!! Does Serafina go the BEST college in the world? I THINK SHE DOES!!! I just wanted to say how totally AWESOME it is for you to reach out to this girl and help her with this. You rock, Jen! You are so sweet and you have given me some ideas too, at least I have until October though. This post could not have come at a more perfect time. 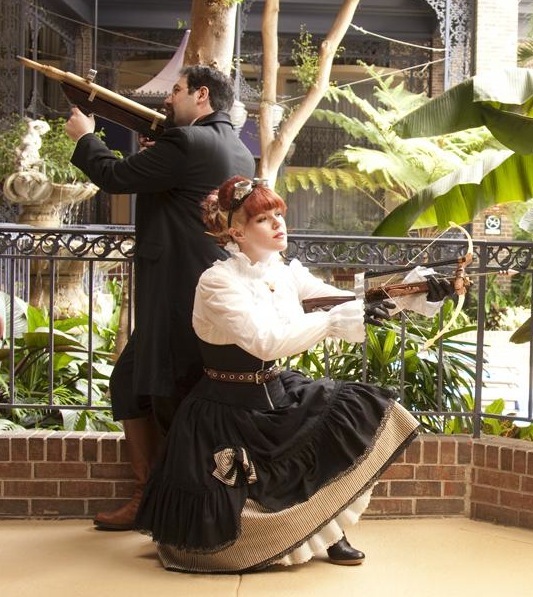 My theater troupe is currently working on a Steampunk production of "Midsummer Night's Dream". 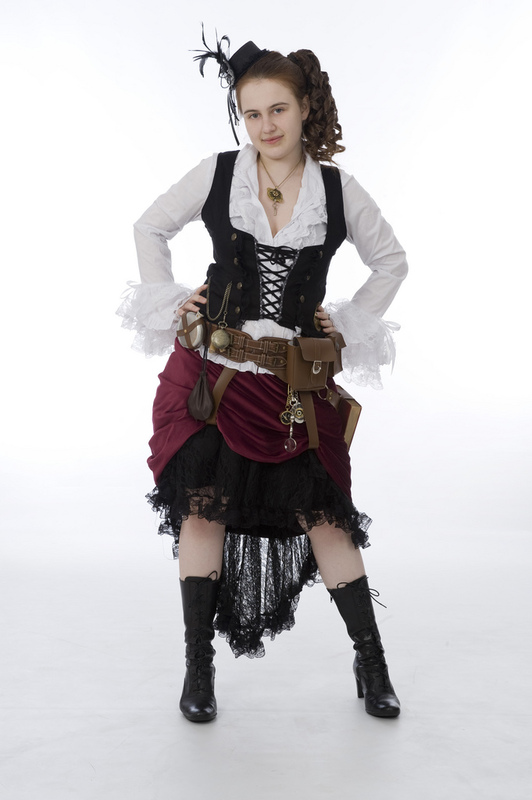 As a plus sized actress, costuming can be a challenge... but you have such great ideas! The one piece I am currently woring on is a corset. I found an inexpensive ugly tan (totally granny style) corset at a discount store for around $10. I am in the process of steampunking it up with brown and gold fabric paint. I think it's going to come out so cool! 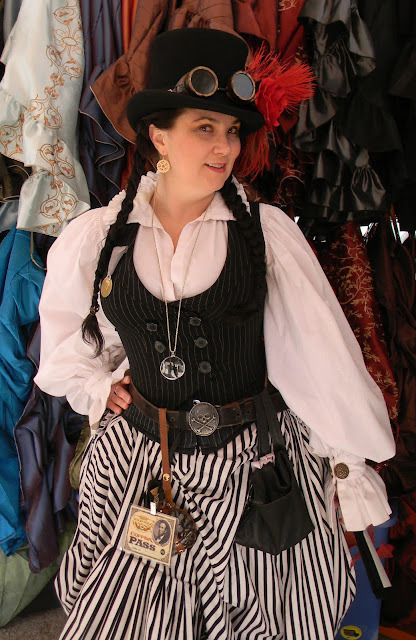 Another good option of how to add steampunk flare to thrift clothing is to find something in a nice white or offwhite color, and stain dye it with brewed, cooled coffee. This gives it more of an aged up cream color and can add some nice waterstain edges that give it a nice 'not so gently used' look. Doing so with satin or other nice (but not dryclean only) fabrics gives you a nice formal sheen that I think is a nice contrast to the aged look of the dying method. 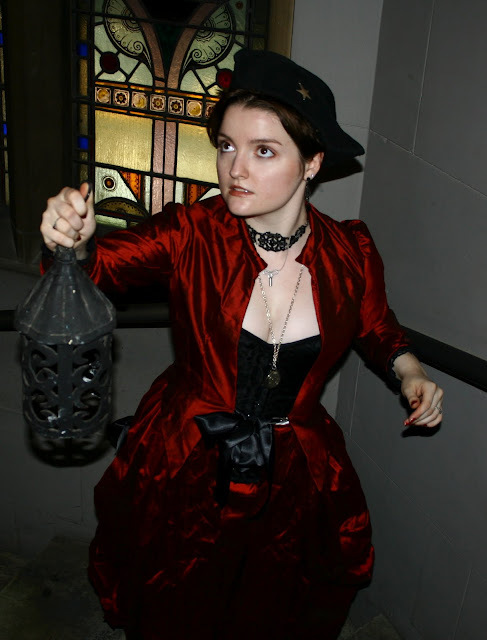 Most of the things I found were much more basic than what this reader wants--BUT, I discovered an amazing seller of NEW historical replica dresses, and some of the dresses were starting bidding at 1 penny!!! I followed some of the sales, and found that some amazing dresses sold for as low as $60-80, which is amazing. And some of those dresses would be PERFECT for a Steampunk prom/bridesmaid/wedding dress, esp. a certain beige/copper/black number that is like New Orleans Steampunk--a little goth, very dreamy! So anyone interested in knowing about this resource, follow the link trail--it is a store worth keeping tabs on. Sometimes short dresses can also be used as bodices layered over long skirts. Something like this, for instance. Check out the doll section of your local craft store for a tiny top hat base & have some fun with ribbons & feathers. Thanks for sharing the tips! Being 29 I won't be going to prom this year (ha!) 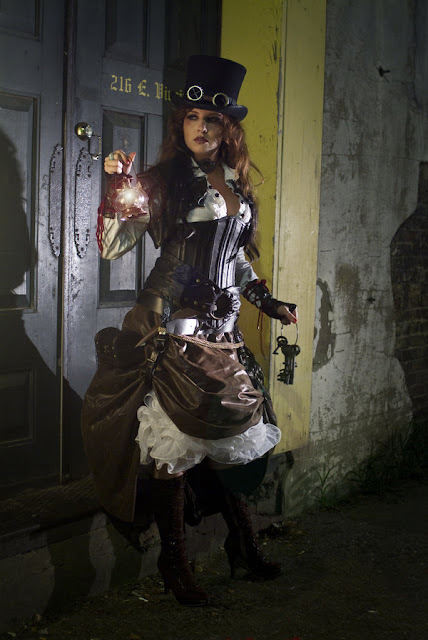 but I do have a fun steampunk idea for Halloween. So these will come in handy! Also, did you see your Mountain Dew bottle jewelry stand on Dollar Store Crafts? If you can crochet --- there's all sorts of "fake suede" type fiber or even thin leather strips or cord you can crochet into a thick belt or corset. Heh. My date is resisting the idea of a top hat, but other than that I don't know what he's planning. Jen, thanks so much for the helpful response. And thank you to all the commenters. After finals I'm going to really start looking. Prom is May 19th so I'll try to send pictures soon after that. Sorry for the long, hideous link. 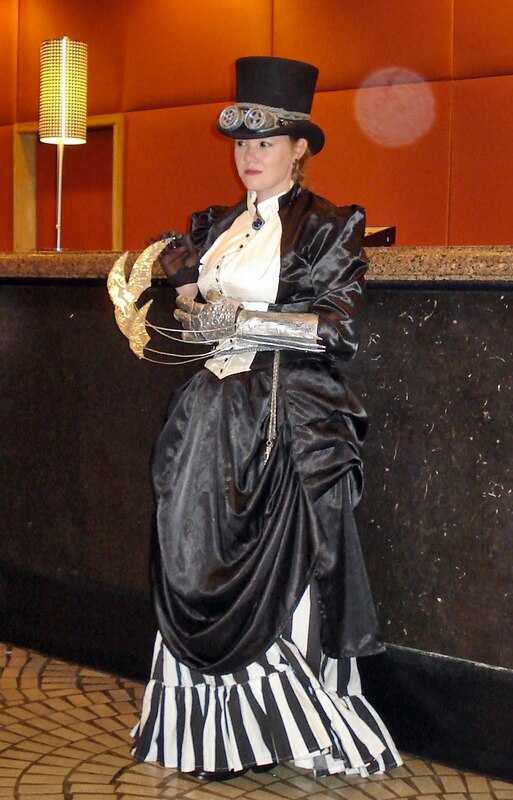 But seriously- Imagine this, pulled up a bit in the skirt, with an underskirt of black or emerald. Paired with a poofy white blouse and a tight vest, some patterned hose and boots. Add some goggles and voila! 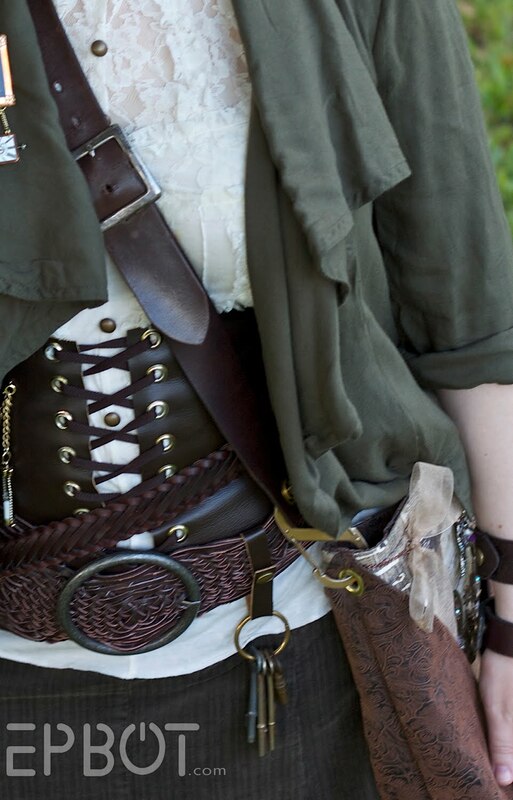 Steampunk is all about the colors and textures. Deep rich jewel tones line burgandy, violet, black, navy blue or brown. Stay away from the lighter colors. Use antiqued copper or brass as accent colors and you are all set! I'm wondering if a corset could be made from a strapless prom dress that has boning in it? It would end up being laced from the back zipper of one (although you could always cut up the front and ignore the zipper or wear something to hide it), cut off the top to go under the bust, & cover the all the edges with contrasting binding. Then add grommets and ribbon to lace it up. The timing of this post is kind of funny, because I had a dream the other night about make a green dryad costume for Halloween out of old prom dresses. 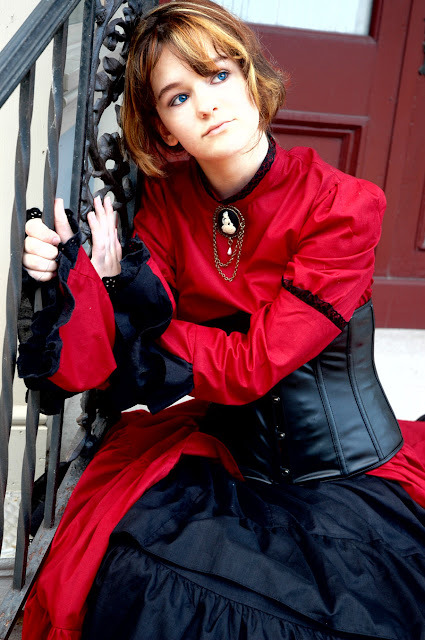 They're running a deal right now for corset/skirt sets for $15. Unrelated to anything steamy, I wanted to show you a friends etsy featuring tardis necklaces and shoes, and even a companion cube pendant. Haight Street has a ton of thrift stores with good selections, also the Mission district for Quinceniera dresses. There's a GoodWill at Mission and South Van Ness streets that people said always had good stuff. Check with any theater friends you might know; SF Opera has a yearly sale of old costumes. General Bead (near 8th and Mission) is a great place for accessories -go UPSTAIRS for feathers, beads, charms, etc. Also, look up consignment shops in the wealthier neighborhoods. You may find more formal/luxurious fabrics. David's Bridal might have dresses on sale you can modify; wouldn't hurt to swing by one if you've time. The costume sale at the SF Opera once about every five years. It is amazing, but it just happened a few months ago. I forgot -if you like to dance, buy your shoes FIRST and wear them! Thick soft socks and/or inserts will help not hurt your feet more than you need to. I love all these ideas. I've used an easy way to "victorianize" regular blouses and wrote up a tutorial with pics on my blog. Minimal sewing (could even be done by hand) and makes a blouse look way more appropriate. I hope she shows us the end result! 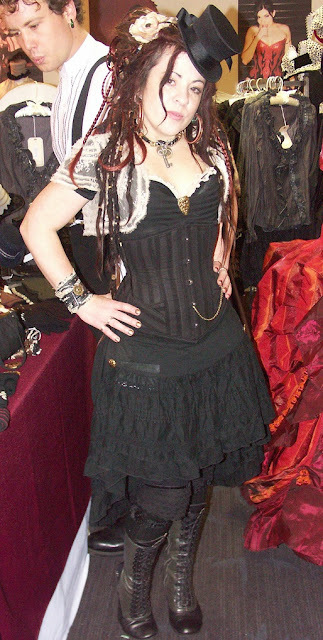 you can also make your own corset out of cut up leather pants or a leather jacket - I found some at my Goodwill store for $5 each and all it took was a few grommets and some leather lacing to make it look good. Charlotte Russe often has "corset" tops in their store - and they're no more than $15 or so. This is such an awesome idea for a prom!! 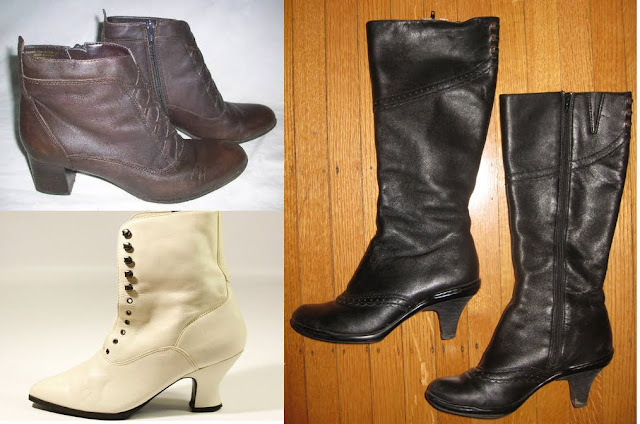 I know you probably aren't reading this anymore, but if anyone else is looking for steampunk/victorian era style boots, here is a trick from working at a historical park: The old style, leather skates that you have to lace up are perfect once you unscrew the blades from them. They usually come in white for women, but those can be polished (with a lot of polish) to be black or any colour you want. As well, women often fit the larger boys skates which come in black. As an added bonus, because you are buying used, they are already broken in!